CBO estimates that the combination of policies under current law will reduce the federal budget deficit by $607 billion, or 4.0 percent of gross domestic product (GDP), between fiscal years 2012 and 2013. The resulting weakening of the economy will lower taxable incomes and raise unemployment, generating a reduction in tax revenues and an increase in spending on such items as unemployment insurance. With that economic feedback incorporated, the deficit will drop by $560 billion between fiscal years 2012 and 2013, CBO projects. The CBO makes a point that eventually budget deficits must be reduced. But they imply now is not the time, considering the anemic economic growth. 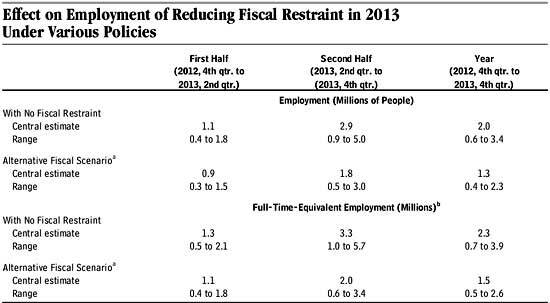 The extension through the end of 2012 of the payroll tax cut for employees and emergency unemployment benefits. That change in fiscal policy will boost real GDP at the end of 2012 by about 0.6 percent but will have little effect on the level of GDP at the end of 2013. CBO expects that households will restrain their spending a little as the scheduled increases in tax rates draw near and that businesses will hold off from some investment and hiring out of concern that the economy will weaken next year. In addition, government agencies may pull back on spending in anticipation of cuts in funding at the beginning of the year. Although quantifying those anticipatory effects is difficult, CBO estimates that they will reduce the growth of real GDP by about 0.5 percentage points at an annual rate in the second half of 2012. Above are GDP, employment estimates by the CBO if the fiscal cliff is allowed to happen. Below is the CBO's alternative budget scenario and notice, all you conservatives out there, Obama care. The automatic spending reductions required by the Budget Control Act, which are set to take effect in January 2013, do not occur (although the original caps on discretionary appropriations in that law are assumed to remain in place). If policy makers left the current status quo, the CBO projects an additional 2.3 million jobs during 2012-2013, which considering we need over 10.5 million jobs, really ain't so hot, yet losing more jobs is simply unacceptable. Frankly that's what recession implies, although the CBO doesn't come out and say it, more job losses. Below are the CBO's employment projections if the fiscal cliff is stopped, for the status quo and their alternative budget policy proposals. With a large amount of unemployed resources in the U.S. economy today, CBO estimates that the indirect effects probably enhance the direct effects, on balance. Those additional effects can be represented by a demand multiplier, defined as the total change in GDP per dollar of direct effect on demand. Because there is considerable uncertainty about the economic relationships underlying indirect effects, CBO used estimates of that demand multiplier under current economic conditions ranging from 0.5 to 2.5, encompassing a broad range of economists’ views. We have a very hard time believing individual tax cuts for the rich actually support an indirect 2.5 multiplier. Now tax cuts for small businesses, that's another story. Previous multiplier and real estimates of what the Bush tax cuts did not do, such as tax cuts for the rich did not create jobs, bear that out. $1 in federal purchases of goods and services would raise GDP cumulatively over several quarters above what it would have been otherwise by between 50 cents and $2.50; those effects are larger than for other policy changes because such purchases have a dollar-for-dollar direct effect. CBO estimates that a $1 reduction in the employee’s portion of the payroll tax would raise GD P cumulatively by between 16 cents and $1.